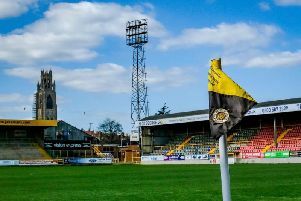 Ashley Jackson says he would ‘love’ to extend his Boston United deal. The left back has featured in 36 of the Pilgrims’s 40 contests this campaign after joining in the summer from Ossett Town. And he believes he can continue to improve his game if given another campaign at the Jakemans Stadium. “I’d love to be here next season,” the 24-year-old told The Standard. Jackson has overcome a bout of pneumonia and now has a battle for his position with Chesterfield loanee George Smith on his hands. But he always expected to have to fight for a Pilgrims place. “When I first came I didn’t expect to play, Goughy (Jordan Gough) was in the team,” Jackson added. “I thought I’d go, learn and see what it’s all about. It’s been a lovely experience. An impressive pre-season saw Jackson make the number three shirt his own, building up an instant rapport with the home support. “I love it. The fans are fantastic,” he said, admitting it took a little time to get used to the vocal opposition fans on away days. “My mum and dad come and it’s been in front of crowds with one man and his dog in the past, so it’s nice to give them a cheeky wave. “The crowd spurs me on that bit extra. It makes me want to paly football. “It’s different away. If you give it, you’ve got to take it. It’s another side of the game, there are examples where that’s got the better of me and other times I just blank it out.